Watch the Video Yes. Real-time rates, label creation, and tracking with all major carriers. Rate quotes before checkout but no label creation. 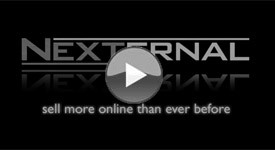 Watch the Video Yes, native in Nexternal.NET. Available with installation of CRE SEO URLs. Avalara Tax Service Integration Yes. Pull Avalara Tax Rates. Have Avalara submit taxes. Not available. Reliability Nexternal hosts and maintains the application with 24/7 monitoring CRE Loaded is hosted by a third party. Reliability varies. Load Balancing Yes No, software sits on a single server. Comparison Shopping Marketplace Feeds Automated - Run Daily Must Manually Create and Submit Data Files. CRE Loaded is a Trademark of Chain Reaction Works. Information was collected from CRE Loaded's website (www.creloaded.com) in order to compare it to Nexternal's shopping cart application. To report an error or discrepancy, please email .